Adhoc testing is one of the widely used testing practiced, this is informal type of testing where any kind of documents are not prepared. And testing is done without creating the test cases. The main aim of this testing is to find bug by testing the functionality randomly and providing random inputs. When to perform or when Adhoc Testing is preferred: there are many occasion when this AdHoc testing is preferred. One of the occasion is when there is less time remaining for the testing team to test then AdHoc Testing is preferred. Another occasion is when there is less software specification document are available then also AdHoc testing is preferred. This testing also performed when formal testing is done. To before the release this testing is also done to ensure that system is working properly. when there is less time. when less software specification document available. performs after formal testing or perform before release. Who perform this Testing : if you have these question like is there any separate tester with different skills who will perform this testing? The answer is no, it is does not require any special testing team a normal tester can perform AdHoc Testing, but the tester who are going to perform AdHoc Testing, should have depth knowledge about the system under test and should have good domain knowledge also. Then only he can perform Adhoc testing. Tester with Depth knowledge about the software under test. Tester who have many years of experience in same domain. I hope you all have got an idea about what is Adhoc testing, who performs Adhoc Testing and what are the Occasion on which we performs Adhoc Testing. Now let’s talk about how to perform Adhoc Testing. While performing Adhoc Testing, there is not any particular flow, steps or practice that tester need to follow. Here tester test the software functionalities in random manner. And it does not in a proper flow. Tester just users its knowledge and his experience to find out which area of software may cause the error. 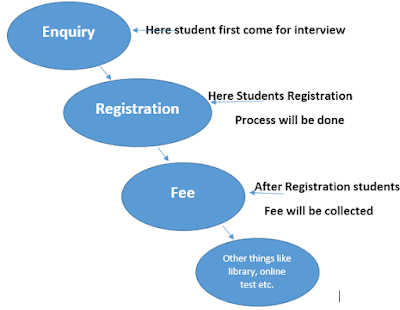 Let’s consider an educational software and tester are performing Adhoc Testing on it, usually and common modules of education management software are enquiry module, Registration Module, online test, fee module, library module, store module and many more but this are the common module in educational management software.if you going to consider the flow it would looks like as shown in the following image. So In formal testing, first tester will review all the document, then will spend time to understand the requirement and working of the software. Then tester will find out the scenarios and will write the test cases for the same. And will execute it on the software. This is a formal testing flow now take a look at AdHoc Approach. While performing Adhoc Testing, tester not necessary start the testing with first module i.e. Enquiry module, tester may start testing with any module like it may start with fee or it may start with registration. It is totally depends on testers thing which module can cause or have bug. Tester uses error guessing approach to guess the bug in the system. Adhoc Testing Does not have any flow. If tester get some bug then it will be reported to concern developer. Main problem of Adhoc Testing is to reproduce bug. It becomes difficult to reproduce the bug as the tester does not have any steps written. AdHoc Testing has following types. Buddy Testing : In this type of AdHoc Testing, one person come from development team and other person come from Testing team and they both assigned to a module. Together the test the module.if tester has any queries then developer try to resolve it. This Buddy Testing usually done after unit testing. Pair Testing : Pair Testing is another type of Adhoc Testing, unlike Buddy Testing here both person who are going to test software or module are from the testing team. One tester test the software and other tester takes note. Monkey Testing : Monkey testing is third type of Adhoc testing, here the main aim of the Monkey Testing is to break the software. Here the software is tested in random manner with providing random inputs to the system. Does not require any documentation work. Useful when we do not have sufficient software specification. Easy to start, does not require pre-planning. Tester should be very skilled and should have depth knowledge about software, if tester does not have the proper knowledge about the software then he might consider a feature as a bug or bug as a feature.